Below you'll find links to draft design options for The Parade. These options are based on the Design Objectives and Design Statements that were developed over the course of the previous Love the Bay workshops. These are the same options that were on display at the drop in sessions, so if you gave feedback there, you don't need to submit it again. Feel free to use the draft design options for inspiration. If you like or dislike an option, think about the reasons why. What design statements does it achieve well? Are any of them missing or better captured in other options? The goal of this exercise is to help the designers understand what works for the community, and what doesn’t so that it can be addressed in the overall design. The deadline for submitting feedback was 9 PM on Sunday, 28 May 2017. Feedback is now closed while engineers and designers incorporate it into designs for consideration by Council. The links below will take you to a range of options for different elements of The Parade. We recommend starting with the Carriageway section, which shows options for the overall treatment of The Parade. 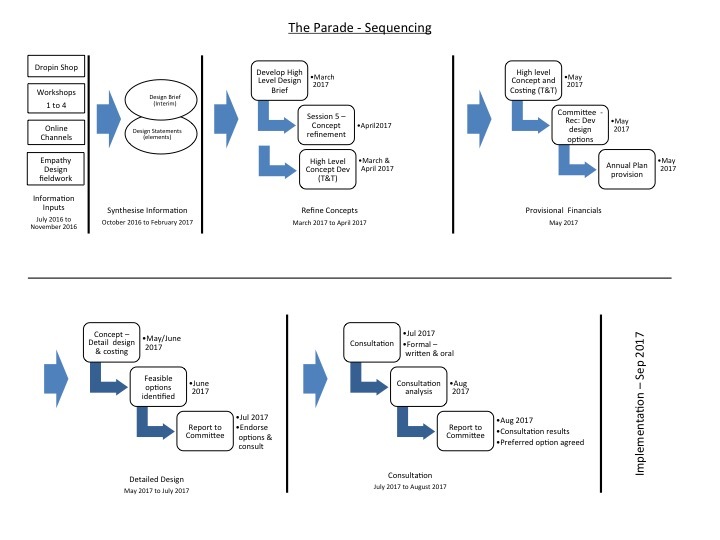 The other sections show how potential treatments could work around specific aspects of The Parade. Each design option has a link to a form where you can share your feedback on that specific option. You are welcome to give feedback on as many or as few designs as you would like. The designs above are not exhaustive, but rather are intended to illustrate a range of feasible options for The Parade in order to prompt discussion and provide context for your feedback. This document [PDF, 89 KB] includes information about other options that experts have assessed as less feasible for reasons including safety, best practice, and/or budget. If you are interested in learning more about some of the guidelines and policies behind these assessments, click here. Even if an option is less feasible, it is important for designers to receive feedback from the community about why that option might be preferred so that they are able to try to address those needs in other ways. If you have feedback about designs not included in the options on this website or have other feedback to share, click the button below. All of the feedback obtained through these sessions, past workshops, and other channels will be combined with other technical information by Tonkin and Taylor to develop high level designs. These high level designs will be provisionally costed for inclusion in the Council’s annual planning cycle in late May 2017. Designs will be further developed (including feasibility assessments) for consideration by councillors in July 2017, along with the current and former layouts. Community feedback and the outcomes of the Love the Bay process will also be included for their consideration. Councillors will make a decision on the recommendation to formally consult with the public on the developed design options, during which any interested individuals or organisations can make formal written and oral submissions about the prospective designs. If you’ve subscribed to the Love the Bay newsletter, we’ll be sure to let you know when the formal consultation is open, and it will also be publicised through other channels. Finally, analysis of the consultation feedback, budgetary implications, and changes made as a result will be presented to councillors with a recommendation on the way forward. Councillors will consider this and make a decision on a design approach with the intention for implementation starting in spring 2017.